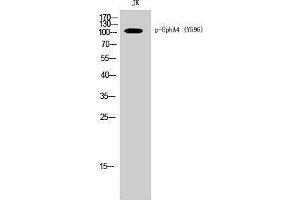 Specificity Phospho-EphA4 (Y596) Polyclonal Antibody detects endogenous levels of EphA4 protein only when phosphorylated at Y596. Characteristics Rabbit Polyclonal to Phospho-EphA4 (Y596). Immunogen Synthesized peptide derived from human EphA4 around the phosphorylation site of Y596.